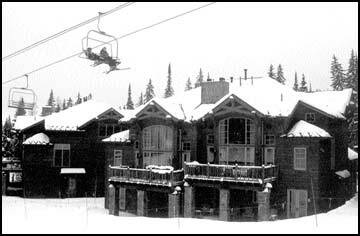 Skiers ride the lifts at Big Mountain on Thursday, perched high above residential developments on the mountain. As real estate prices soar and upscale residential development crowds the ski slopes, a new breed of investor is emerging to capitalize on - and provide capital for - big changes. WHITEFISH - Back in the 1940s, Whitefish locals finally tired of hiking up the hillside just to ski back down. So they called Karl Schenck's dad, who sold ski lifts. "He got so excited about the idea," Schenck said, "that he just joined up on the spot." The Schencks are now something of a fixture in town, a founding family of what is today Big Mountain ski resort. Other Whitefish families joined the Schencks' homegrown effort, buying stock and putting what money they could into his struggling enterprise. For decades, the hardware store owner accepted ski area shares in lieu of cash when Big Mountain couldn't pay its bill. The grocer and butcher and insurance man did the same, amassing lots of Big Mountain stock that wasn't worth much at the bank, but was priceless as an investment in their community. In short, they made it possible. Now, however, with opportunities for real estate profit seemingly endless - and the cost of running a four-season resort likewise sky-high - a new breed of investor controls the bulk of Big Mountain's shares. "They don't want us around anymore," Schenck said. "People feel betrayed. They're angry. Apparently, everything the Mountain's doing to us is legal - it's just not very nice." What Big Mountain is doing is called a "reverse stock split," a move that reels in shares from smaller stockholders. For every 15 current shares, one new share will be issued. Anyone owning less than 15 shares will be paid off and ushered out of the ownership club. People like Schenck say it means the end of locals' ownership in their own community. People like Fred Jones, CEO of Winter Sports Inc., which runs the resort, say it means a streamlined and tax-efficient business model, a structure more likely to attract and retain the big investors whose capital is so badly needed in the modern marketplace. "But we still think we can have the best of both worlds," said Dale Duff, who like Schenck is losing his small share in the ski area after generations of ownership. Duff and a broad coalition of smaller shareholders have crafted an alternative to the reverse split, a creative plan that would give the big investors their tax efficiencies while making room for the little guys, too. The question is, are they too late? A month or so ago, Charlie Abell received a letter in the mail notifying him of the upcoming reverse stock split - a move the letter said was "virtually assured." His dad, the Whitefish insurance man who traded stock for services, had left Charlie a community inheritance in the form of Big Mountain shares. But they weren't enough to keep his ownership after the split. The letter was postmarked Nov. 6. Abell, like others, immediately began looking for ways to remain involved as a stockholder. Some looked to buy additional shares, topping the 15-share cutoff. Some looked to consolidate family holdings that had been spread between the generations. Some looked to create coalitions of small shareholders. Little did they know time had already run out. A full two weeks before those notices arrived in the mail, the company had quietly closed the books, making it impossible to buy, sell or trade shares. "That's the part that angers me the most," said Rick Nelson, owner of the downtown Whitefish hardware store that, in his father's day, traded ski area shares for merchandise. "People were not given the opportunity to get together as a family group and put the stock together. I think it's sad - a sad, sad commentary on the direction the mountain appears to be going. I feel betrayed in a very big way." Betrayed is a word that comes up often when talking to longtime shareholders who helped build the business, but it is also a word familiar to Jones. Back in 2003, Jones said, Winter Sports Inc. conducted a similar reverse split. It eliminated many small shareholders, making WSI small enough to be invisible to federal regulators. (That's when Schenck's children were cut from ownership.) That time, Jones said, they left the books open so families could consolidate. But at least one shareholder used the lag time to game the system, taking advantage of the parent company by breaking up big chunks of stock and selling below the buyout price, but above the market price. That, Jones said, cost Winter Sports a small bundle, and was not a lesson soon forgotten. And so this time, they closed the books before announcing their intent. "The timing was very deliberate," Jones said, "at the advice of our attorneys." "Then they need some new attorneys," countered Duff. The first reverse split weeded out those not genuinely interested in owning a share, Duff said, leaving only those "100 percent committed to keeping their money in." "The last time," he said, "they did the right thing from an ethical point of view. This time, they did not. We were blindsided." Under Winter Sports Inc.'s current corporate structure, investors feel twice taxed. Profits are taxed, and then dividends are taxed. But if the company can further limit the number of shareholders - to somewhere under 100 - then WSI qualifies for a new corporate structure, one that eliminates much of the tax obligation. The new structure also allows the remaining owners to claim business losses against their own personal income taxes. Everyone - grocer, butcher and hardware man - understands the benefits. No one is suggesting Winter Sports should not pursue the new structure. It's just that the little owners want to keep a hand in, for old-time's sake, if nothing else. Duff has proposed a plan that would allow WSI to take on its new structure, while at the same time making room for a parallel small-holder model, under one umbrella. Small shareholders would consolidate, becoming effectively, one collective owner alongside the big guys. It would, of course, be a bit more complicated, even a bit more expensive from an accounting point of view. But it would save the cost of buying out all those little shareholders. It must also be weighed, Nelson said, against the value of 60 years of community involvement and goodwill. "What's that worth?" he asked. "As a businessman, I would think it's priceless." But putting a price on priceless is exactly what the reverse split is all about, and Jones won't commit to the proposed alternative until he knows precisely how many small holders are interested and how much it would cost. "We're totally behind the idea," Duff said of small shareholders. "It's our plan, and we stand by it. Every analysis shows it's just not that complicated, and it won't cost the mountain very much at all." Of course, all of this could have been avoided if only shareholders had been notified, Duff said, and if the board had agreed to a 60-day delay. Now, even if a compromise can be struck, the die is cast. People will have to sell out and then buy back in, absorbing a capital gains tax hit. They're surprisingly willing to do so, Duff said, but even that could have been avoided with proper up-front notification. "But there's been this rush," Duff said. "That's what I don't understand - why the rush to get rid of us?" Even now, he said, Winter Sports continues to rush, pushing to get payoff checks into the mail even before all shareholders have been notified that there might be an alternative. So far, Duff said, his group has contacted about half of the 250 or so small shareholders, and of the 50 who have responded all have said they're interested in retaining ownership. No one, he said, has expressed opposition to the compromise plan. Now, Duff wants time to contact the remaining 125 or so small shareholders before the checks are sent, letting people know there could be an option. And while Jones does not want to delay the payouts, he is willing to perhaps include a note with the checks, advising those interested in retaining ownership to contact Duff and his group. "We are very committed to working together," Jones said, "whether it is with this proposal or something else." "Something else," to date, means a Winter Sports proposal to create a "Founders Club," an unofficial gathering of former owners who would meet for an occasional chat. "Gee whiz," Schenck said. "Thanks a lot. The people who did all the work up there, who packed the snow with their boots, they get invited to a spring picnic. Thank you very much." Jones admits the Founders Club might not be a workable solution. "But we're trying," he said. "We're absolutely trying to work something out." The problem is, Jones said, "the cost of running a resort is way bigger than the locals can afford. That's the reality." A replacement chairlift, to be built next summer, comes with a $5.2 million price tag. "Things change," Jones said. "We aren't going to go to Nelson's Hardware to fund that kind of work. That's the way it is." Nelson doesn't disagree. He and Duff and others know full well that locals cannot carry the weight in today's world. But they nevertheless believe they can still play a role. "History, community, identity, culture - these things have value," Duff said. "It's the difference between a house and a home. A house can give you shelter, but a home gives you roots, a sense of belonging, a knowledge of who you are." When those things are lost, small shareholders say, the company on the hill has potential to become a predator, feeding on the disenfranchised town below, bleeding profits away to a handful of far-flung owners whose only community connection is a fiscal margin. Yet when those things are retained, small shareholders say, the company on the hill has potential to become a partner, with town and mountain feeding one another and retaining the "genuine" hometown brand that keeps the money coming. These are concepts hard to fit into an annual report, Duff admits, this sense of belonging and ownership, "but it's alive. It has a heartbeat and a feeling and a spirit. These values continue on, beyond profits, and they're ultimately what will make the business attractive into the future." Meanwhile, Schenck - whose visionary ski-lift-selling father made all this debate possible - agrees the future is here, and hopes the new corporate structure can keep the business his dad built in business. "But I'd also like to keep a small hold on my heritage," he said. "That's really all any of us want - the chance to hang on to a piece of our own personal histories." Take that away, Nelson said, "and I see some real potential for animosity, some real 'us and them.' "
Everyone in town knows the "us." They're the names attached to pretty much everything in Whitefish, from ski runs to breakfast specials. As for "them," Jones said, "some people have recently made some very big investments up here, and we do have to be responsive to their needs. "We're balancing the old and the new, and that's a tough balance to achieve."